Click on the pictures to view all the albums! IFORS 2017 mobile application is available on your mobile device app store! Access the IFORS 2017 mobile conference program to keep all the details you need at the fingertips of your mobile device. Download the app by serching IFORS 2017 on your mobile device app store or click here to scan the QR code. To see the program at a glance, please click here. A schedule of the conference is available at https://www.euro-online.org/conf/ifors2017/program. You can also check the schedule of your talk directly by logging in at https://www.euro-online.org/conf/ifors2017/. To register, click here to access it: https://www.euro-online.org/ifors2017/registration/register/. Please note: in order to appear in the program, the speakers must have registered and paid no later than Wednesday, May 31st, 2017. There are typically 4 talks in each session of 90 minutes. This gives 20 minutes to each speaker including questions, and 2-3 minutes for switching speakers. All session rooms are equipped with a laptop computer and a projector. The files may be in pdf, ppt or pptx format. We encourage speakers to put their presentations on a USB flash drive. Make sure that you have copied your presentation to the computer before the beginning of your session. Visitors must hold a valid passport; a visa or an Electronic Travel Authorization (eTA) may be required. Find out whether you need a visa or an eTA. To obtain an official LETTER OF ACCEPTANCE, please go to the submission page (https://www.euro-online.org/conf/ifors2017/) where a link appears for users that have an accepted paper to generate the letter by themselves. If you are co-authoring a paper, please contact the first author to get a copy of the letter. The letter contains the name of all authors. Welcome to the webpage of the 21st Conference of the International Federation of Operational Research Societies. We are delighted to host the IFORS 2017 conference under the theme of “OR/Analytics for a better world”. The conference will be held between July 17-21, 2017 in Quebec City, the capital of the province of Quebec, Canada. Quebec City is a dynamic and modern French-speaking North American city with a unique “Old France” charm. The program committee is committed to preparing a high quality scientific program with diverse participants sharing their vision, knowledge and experience of operational research and analytics. The venue is the Quebec International Convention Center, conveniently located in the heart of Quebec City and one of Canada’s top convention destinations with renowned hospitality and exceptional service, cutting-edge technology and creative cuisine inspired by the rich culinary traditions of North America’s fine dining capital. 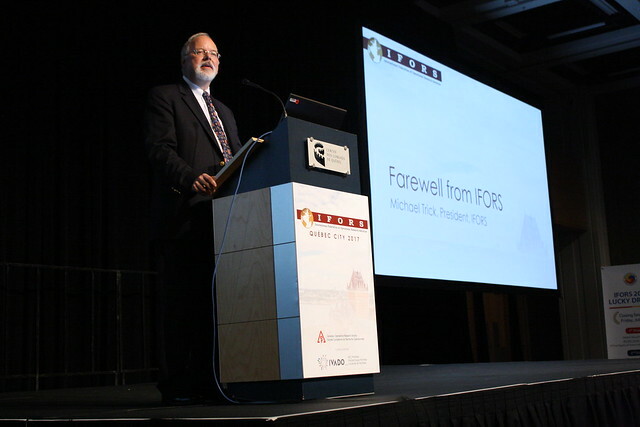 We thereby invite you to participate to IFORS 2017 and be part of the great IFORS community by organizing a session, giving a talk, or meeting new and old friends and colleagues! Egon Balas (Harold Larnder prize winner), Martine Labbé (EURO plenary speaker), Alvin Roth (2012 Nobel prize winner) and Andres Weintraub. Ten keynote speakers will deliver tutorials (one hour each) on a variety of topics. Don’t miss this great triennial event! Click here to register now! The cradle of French North America, shaped by over 400 years of history, Québec City is a charming blend of old and new, offering a wealth of natural, cultural and historic attractions along with the pleasures of city life. Take a historical tour through the only fortified city in North America: Visit Old Québec and Place-Royale where Samuel de Champlain built his first house in 1608, the Plains of Abraham where the decisive battle between the English and French took place in 1759, as well as the famous Château Frontenac overlooking the St. Lawrence River. Québec City is also home to the Musée de la civilisation, the Musée national des beaux-arts du Québec as well as the Parliament Building, where the province's National Assembly sits. Rich in history and culture, the city boasts lively streets, fine restaurants, renowned international hotels, art galleries and street entertainers. There are also a large number of resorts in the Québec City area, which offers plenty of outdoor activities anyone can take part in! Discover – and enjoy – it for yourself! See you in Quebec City. Festival d'été de Québec: To learn more about the Festival d'été de Québec, which will take place from July 6 to 16, 2017, click here. Copyright © 2015 Agora Communication, Tous droits réservés.